On Saturday, November 24 residents are encouraged to recycle their used cooking oil at a one day event at Downers Grove Sanitary District. 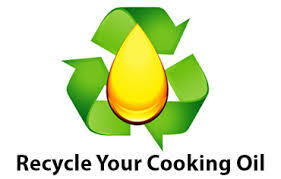 To recycle your used cooking oil (no bacon grease or other solid animal fats), after cooking, allow it to cool, pour it into a container with a lid and bring your used cooking oil to our Administration Center located at 2710 Curtiss Street in Downers Grove. Customers and residents in the area are encouraged to recycle their used cooking oil instead of pouring it down the drain or disposing of it in the garbage. When you pour fats, oils, and grease (FOGs) down the drain, they harden in your pipes or sewer lines and can cause a sewer backup either in your home or neighborhood. FOGs come from meats, butter, cooking oil, lard, sauces, dressings, and dairy products. Even if hot water is running when it goes down the drain, cooking oils and fats solidify as soon as they reach cold pipes. In addition to the one day event November 24, cooking oil (no bacon grease or other solid animal fats) can be dropped off in a sealed container at the Administration Center at 2710 Curtiss Street, Downers Grove at any time. The Village of Westmont’s Environmental Improvement Commission (EIC) and the Downers Grove Sanitary District has partnered with SCARCE, a local environmental non-profit organization, to be a permanent collection site for their cooking oil recycling program. Here are some additional tips for handling F.O.G. For larger amounts of grease or animal fat (ie the stuff that solidifies at room temperature), allow it to cool and pour it into a plastic container with a lid. Store it under the sink until it’s full, then place it in the trash. When cleaning up, scrape leftover food into the trash, don’t send it down the sink. This saves water and prevents trace fats from clogging your pipes. After allowing pans to cool, wipe them out with a rag or paper towel before you wash them to remove excess fat and oil. Please note, this program does not include the recycling of motor oil. The Village of Downers Grove collects motor oil at their Fleet Services garage, 7:00 a.m. to 3:00 p.m. Monday through Friday.